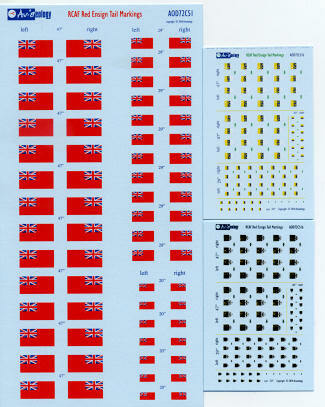 There are many times when one just needs a decent set of RCAF Red Ensigns to do a custom model. Many of us like to have a unique subject from the rest and one of the easiest ways is to have markings for a kit that are not available in the box. Previously, Aviaeology released a sheet of Maple Leaf Roundels and now we have the fin flashes for that period of time when the RCAF used them in the mid-1950s to the mid-1960s. Like a lot of Air Force insignias, these were not static. The RCAF had versions that while looking the same, had details that changed with time. In this case, the crest on the ensign changed. You can see this in the scan below. 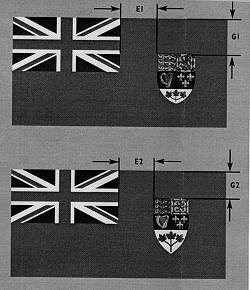 To allow this change to be correctly modeled, Aviaeology has provided separate inserts to add to the basic ensign. The sheet instructions provide a rather well done explanation of what is used when and where, though really, photographic evidence is the best way. Fortunately for RCAF fans, there is a book by Pat Martin that is most useful for this so is worth seeking. In all, it is a great sheet that offers three major sizes of the ensign as well as infomation on which aircraft generally used which size. So if doing a custom set of markings or just wanting to replace poorly done kit versions, this is a set you really need to have. My thanks to www.aviaeology.com for the review sheet. You can get yours direct from the link.